Aside from being Wendyistas, wer'e fashionistas, too. So, when we ran across this in the NY Times , it had us a bit excited, but perplexed - just a little. During the recent Paris Menswear shows, many (OK, five) designers featured dresses and skirts (Yup, for men!) and those in the audience loved it. So, the point now is: if men already wear make-up, dresses skirts and handbags are not that far away and the designers are showing them. Listen, women wear men's clothing and the world doesn't think that's odd, so an "everyday" man walking down NYC's Fifth Avenue or Main Street, USA in a dress and carrying a Hermes Birkin bag, shouldn't be that strange either. The writer of the Times piece, points out that this trend isn't about being gay or being a cross-dresser, it's just about being fashion-forward. The look, to be clear, is not at all about cross-dressing. 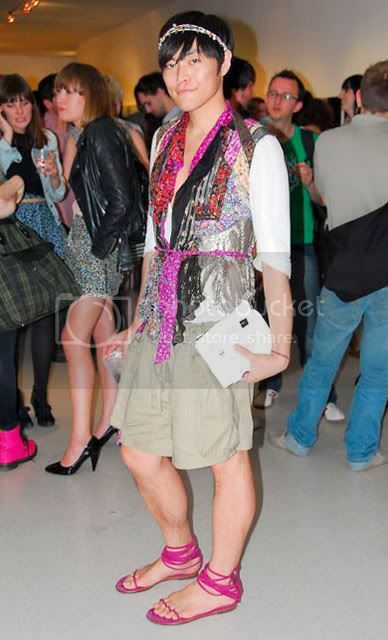 It's men dressing mostly like men but with accessories and the odd (Prada lace) halter from the women's department. It's so genius that it makes you wonder why every guy doesn't do this. 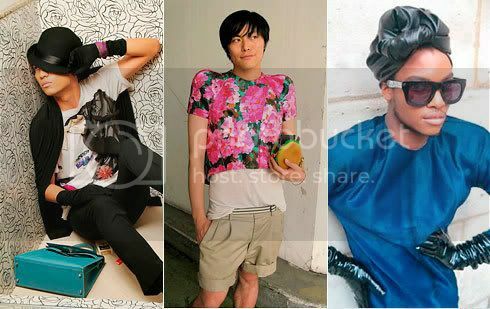 Here are some pictures of the writers' favorite boys in their fashion-forward garb and their Birkins and Balenciagas. What's your fashion philosophy? "I don't dress to appeal to a possible partner. I dress to impress myself! A few years ago I promised myself to try out every clothing style that appealed to me, whether it be goth, punk or dandy. I bought what I liked, made certain looks work for me, and thus found a way to dress that I could call 'me.'" First foray into the feminine realm: "I took the easy way, I guess. I started with parts of an outfit and then I found problems finding what I wanted in my size, so I bought women's clothes because they fit better. I guess the shoes were the last touch. I started wearing them about two years ago." Why go gal? "I think men tend to buy some items that are originally made for women because they can't find them made for men. A nice Chanel jacket, for example. It's only since men started buying them that they are being made especially for men. But even then in a very much different fit. And since we started using makeup, why not have a good bag, too? Be it a clutch or shopper." What's your fashion philosophy? "Look ridiculous in the best designers' clothes. I've never wanted to look cool in my life. My entire life is like a joke anyway. But I don't like wearing costumes on the street. A costume is not fashion, and what I try to do is fashion." Your bag of the moment? "I used to buy bags from Balenciaga, Prada, etc. -- the latest look or key trends every season. But at the end of the day I didn't really use them. After I bought them, I forgot about them. I like Carine's no-handbag policy." Why go gal? "Clothes are getting more and more borderless, like the new YSL unisex collection. Women's wear always takes ideas from men's wear, so why can't men's get influence from women's? Anyway, the biggest reason is men's wear is more boring than women's wear!!" I've never been influenced by others for style. I know who I am and what I am wearing." What's your fashion philosophy? "Gender is irrelevant whenever I admire something. I like what I like and if I can afford something, I buy it." Why go gal? "I'm a rather pixie-sized guy. I'm 5'8", 5'9" and relatively slim. Back in the dark ages (let's not even go there), finding clothes that fit skinny boys was so hard. Those 24-inch CK jeans were (emphasis on 'were,' haha) my best friend! Growing up in the '90s, the whole men's-wear scene was so different than what it is now. Everyone was big, bulky, ripped and testosterone-charged -- Marcus Schenkenberg, is dat chu? 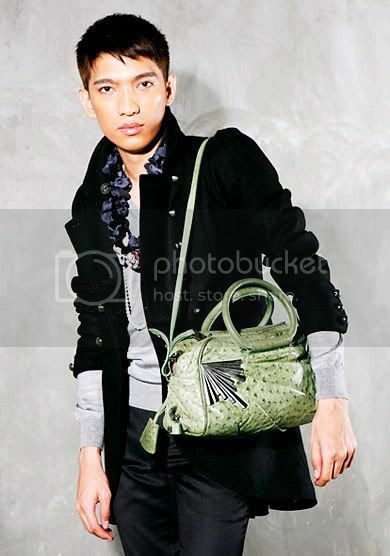 How can a slim, lithe, Asian teenage boy relate to that?" We love it. Y'all betta wurk! Coco Channel and YSL revolutionized women's fashion by dressing women in men's clothes. Lead the charge.